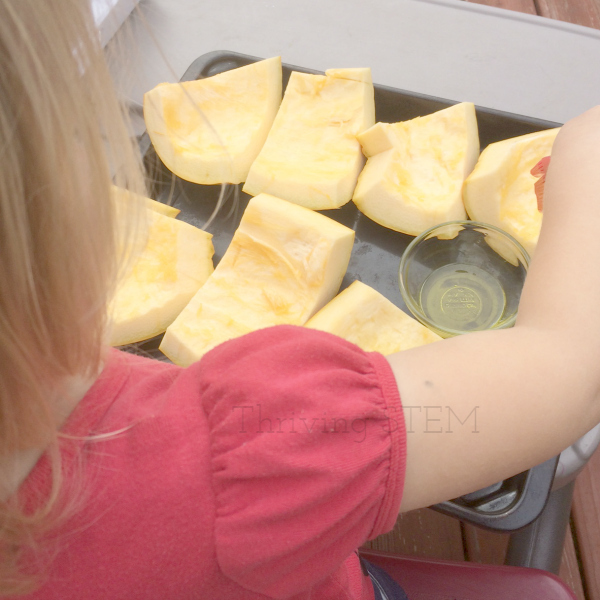 Preparing pumpkin for pie can be a fall sensory experience your children look forward to every year. Two ambitious to preschoolers to manage, and all the traditional dishes to prepare for Thanksgiving. Other women were cooking delicious dishes from their own countries, but it fell to me to bring the traditional American Thanksgiving fare. On the day of the meal, my husband took the children out to a playground while I smashed spices with a rolling pin, measured flour, and ran to the bakala for sweet milk instead of the yogurt drink I'd accidentally bought. That was the first Thanksgiving we celebrated far from family, but not the last. When you are the mom of young kids providing the tradition you want for them can be exhausting. How do get everything done while you make great memories? Nothing says traditional Thanksgiving more than pumpkin pie. Enlist your children's help in making your own, and you'll have memories they treasure forever. Even my one-year-old got her hands sticky this year. Here's how preparing your own pumpkin can become a yearly tradition you all look forward to. Pumpkin. My children found our perfect pumpkin out at the local orchard, and you can find them at the grocery store in the fall. Potato masher. If you don't have one, a fork does just fine. I have to confess, preparing pumpkin this way is an all day affair. It will be worth it! Not only will you have fresh pumpkin in the freezer at the end of the day, your children will have eaten a snack they prepared themselves, participated in sensory play and fine motor work, learned new words, done some counting, and made memories they will cherish for a life time. Children are fast! Please keep them away from knives and heat until they're old enough to handle safely. Before you begin, wash off the pumpkin, and slice it open. Set your children up at a sturdy table, where they can make a little bit of a mess. Give them the spoons. Work together to collect all the seeds in one bowl and all the extra stringy mess in a second bowl. This is your first fine motor, sensory activity. While you're working, point out the "seeds", "stem", "pulp" and skin of the fruit. After we did our pumpkin project this year, I came across this genius way to clean out a pumpkin. I'm saving it to try next year! Transition to a sink area. Place the colander in the sink. Help your preschooler stand so that he can reach into the colander. Pour the seeds from the bowl to the colander. Turn on the water. 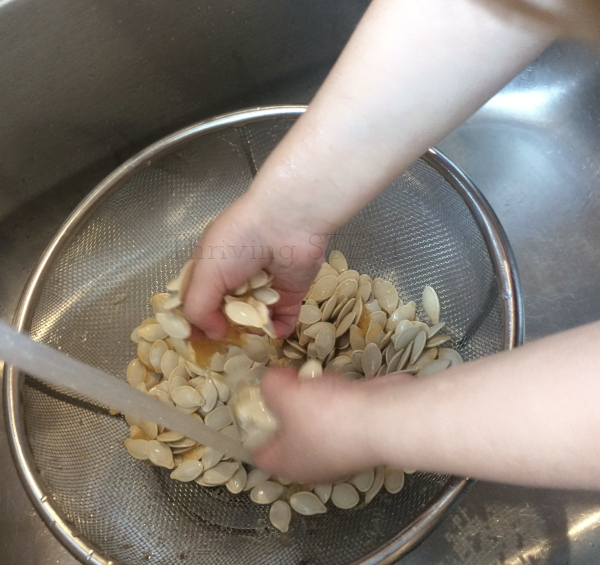 Help your toddler move the seeds around the colander so that excess goop is removed. 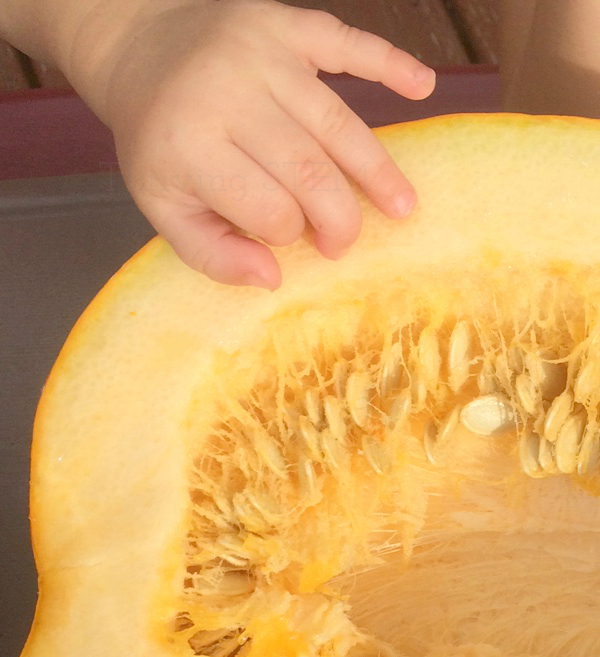 My daughter loves the texture of slick seeds slipping between her fingers. Once the seeds are clean, and your child is bored, dump the seeds onto the clean towels on the counter, and spread them out to dry. Dry your child's hands and let him entertain himself for a few minutes. 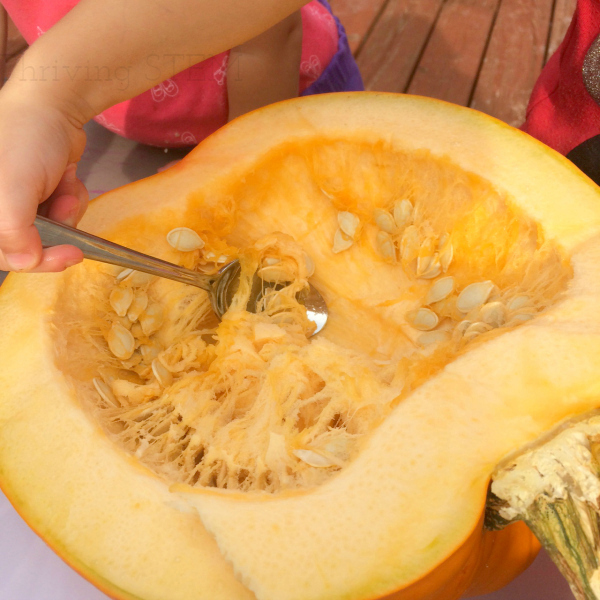 The slippery texture of the wet pumpkin seeds is magnetic to little fingers. Grab the clean pumpkin, and cut it into large chunks. Place the chunks evenly on your baking sheet. Pour a few table spoons of oil in a small bowl. Set your child up at a sturdy place to work. Give her the basting brush (or crumpled paper towel) and let her paint the pumpkins with oil. Flip them over and paint again. Hint: Place the pumpkin skin down before you bake for easier clean-up. My little artist was bursting with pride. Clean your child's hands. Put the pans of pumpkin in the oven, then turn the heat to 350 F (177C). The pumpkin takes 3-4 hours to be ready, so set a timer and tell your little chef that you'll come back to this later. Older children may enjoy using the stringy part of the pumpkin to do a pumpkin experiment like mine did. Younger children will probably need lunch and a nap. When the pumpkin is done, place it on the counter to cool. You'll know it's done when it's soft and you can easily mash it with a fork. Mom or older children can prepare snack. 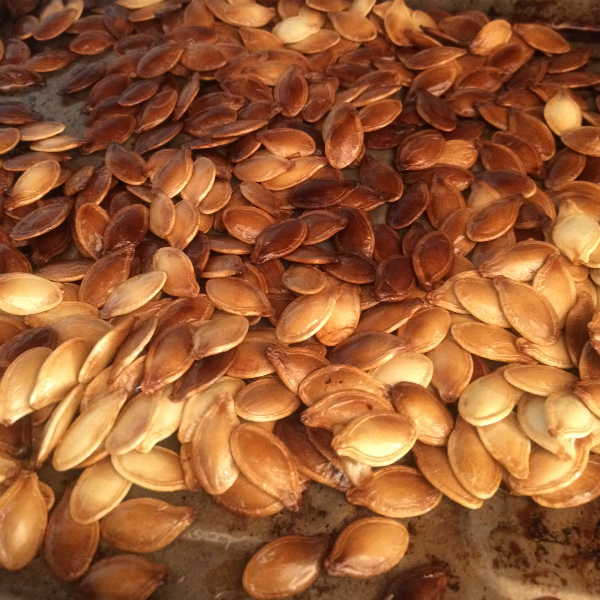 To prepare your pumpkin seeds, place the dry seeds in a bowl with about a table spoon of oil and toss gently. Roast (425 F, 122 C) for about 15 minutes, until golden brown. Cool until easy to touch, and serve. Seeds go from perfect to burnt quickly, so keep an eye on them. 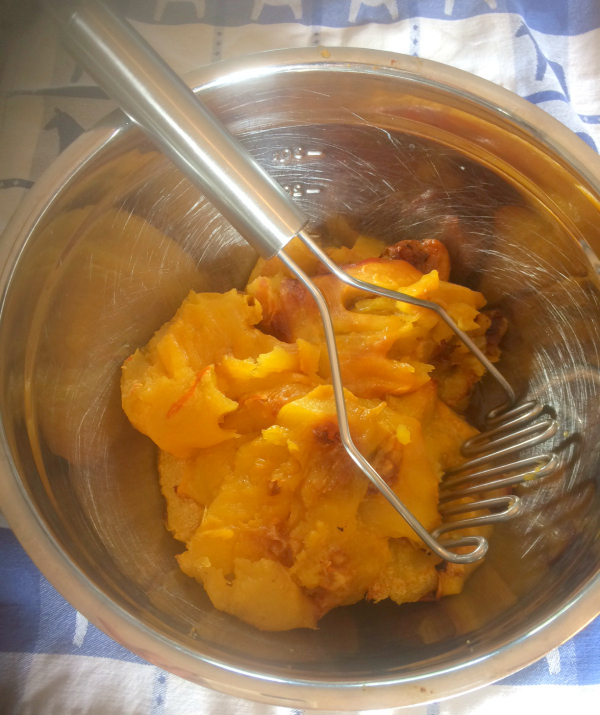 Place the cooled, soft pumpkin in a large bowl. Give your little one the potato masher, or a fork, and let them mash to their hearts content. This was another favorite step for my two-year-old this year. When your child is finished, check to make sure there are no lumps left, put the mashed pumpkin in air tight containers and freeze! That's it! 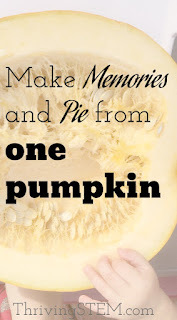 Everything you need to do make a days worth of great memories, and a pie's worth of tasty pumpkin. Well, everything but the dishes. I put together a quick printable pumpkin day cheat sheet for you. You can print it out, use it as a shopping list, and as a guide to remember what comes next as you do each activity. Finish the treasured day off with some gross motor action after nap time. I didn't use fresh pumpkin that first year on my own. I felt lucky to have canned pumpkin, but that was the best pumpkin pie I'd ever made. It turns out smashing your own spices with a rolling pin produces more pungent flavor than buying them pre-ground. So, now I always grind the spices myself, with a grinder though. I save the rolling pin for making pie crust. Did you like this post? Sign up to be updated with new and seasonal ideas for STEM learning each month.